Published: June 21, 2012 at 12:06 p.m. There is so much to get to in Tom Brady's entertaining interview Wednesday with SI.com's Jimmy Traina that we almost don't know where to start. Since we somehow feel like less of a man (which is tough) if we opened with his comments on his hair or Gisele, let's open with his comments on the Hail Mary in the Super Bowl last season. "It's interesting because this is the first time someone's asked me that question. I threw it and when I let it go, I knew we were gonna have a chance. The ball got batted up in the air and I saw it tip 60 yards away from me, but then I got knocked down, so I fell to the ground and I saw the ball get deflected," Brady said. That must have been the most oddly intense moment of Brady's career, on the ground, waiting to find out whether he would spend the offseason brooding or celebrating. 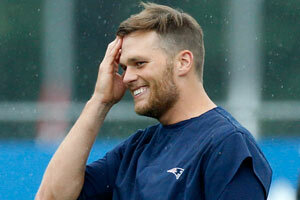 "Unfortunately, though, I looked over and saw the bad guys running on the field," Brady said. On Rob Gronkowski's dancing: "I've seen him dance plenty of times. On pools, on tables, everywhere." As for after the Super Bowl ... "Everyone's blowing off steam. It was unfortunate we were in a public place. I wish we, as players, had a private place to go. He's a great guy. He loves football. What he's accomplished over two years has been remarkable." On watching this video: "I've had a lot of ridiculous haircuts. That's what I realized." On the Giants: "Geographically, we're very close, so yeah, there's something to losing to them twice in the Super Bowl in the most meaningful game of the year and the most meaningful game of our lives. You think about some bad memories from games you lose and there's that blue uniform with white numbers. That's what you think about it." On not joining Twitter: "My fear with joining is that I bore people. And I don't want to do that. If I have something to say, I want it to be meaningful." We'll settle for more interviews like this from the usually guarded Patriots quarterback.